Oldschool BIONICLE watches on Amazon? That's right, thanks to watchful member, Objective OBZPC again (It's a pun, hah! I crack myself up) we've rediscoverd lost watches of old--in fact, two that I never even knew existed! Amazon.com has listings for three of the original watches...including Rahkshi, Visorak, and Hordika. While the prices are a little steep (at $17.99 USD per watch) it's up to you (yes you!) to decide whether you feel it's worth it to own what seem to be some rather rare items! Sharp-eyed BZPower member Objective OBZPC Again spotted a new Bionicle book for pre-order on Amazon.com. The book is described as being targeted at younger readers, and the description reads "Join Takanuva, the Toa of Light, as he journeys to Karda Nui to find the other six Toa and deliver an important message." The book can be pre-ordered here. The time has come, the members said, for the release of the latest chapter of the podcast story Dark Mirror. This time around, things might start looking up for Takanuva, but they definitely got more complicated. For the whole story, of course, you'll want to head on over and listen to chapter 4 yourself, so what are you waiting for? In 2009 the BIONICLE universe will return on the screen. A contract with the American animation company Tinseltown Toons was signed in the autumn of 2007 and will result in three films during the years 2009 to 2011. So far, three films about the BIONICLE figures have been produced. So it looks like we will be seeing more Bionicle films over the next couple of years. We'll have to wait until they get closer to learn what they are about. There are innumerable questions to be pondered in the life. Pondering becomes so ponderous in itself. Consider: Is there any rationality in this universe, or is the whole of existence absurd? Is it I who has a certain way of picking up a fork, or a fork which has a certain way of having itself picked up? Where were the spiders? Is 8949 Kirop a good set to buy? Fear not, BZPower. I'm here to help. As countless sharp-eyed Bionicle fans have noticed, the awaited fourth chapter of Federation of Fear has been posted on bioniclestory.com. Head on over to read about a motley crew of familiar villains including Brutaka, Vezon, Roodaka, and more. BZPower Reader .:Shock:. 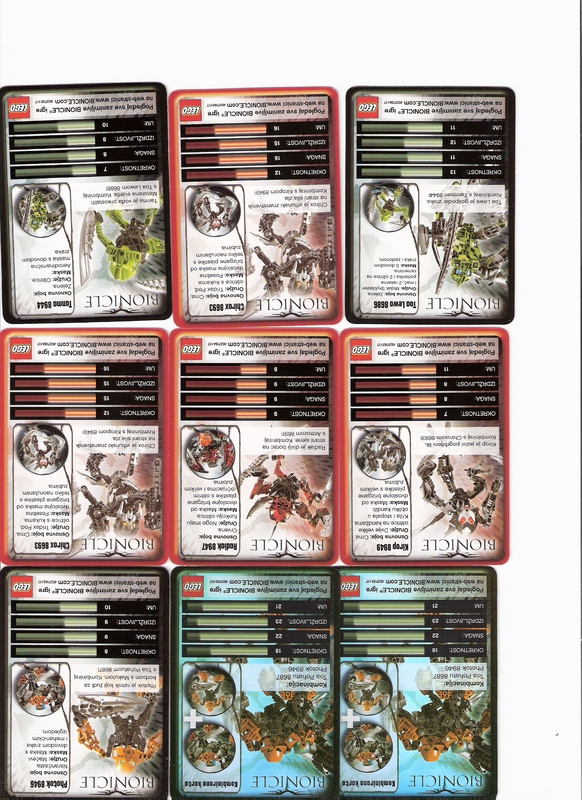 has provided more information on the Bionicle Battle Cards previously reported here. An image of the cards is available on this page. Read on for translation of the text. Toy Fair 2008: But Wait, There's More! Due to various factors, including space limitations, not all upcoming Lego sets were on display at the Lego Collector's Party last weekend. However, as we departed we were both given the 2008 Lego Press Guide, which contains pictures of all the sets released and to-be-released this year. Thanks to the magic of a scanner, we will now give you a look at the rest of the new sets for this summer. Read on and enjoy! In the wake of Toy Fair there is always a substantial amount of hubbub and chatter regarding news sets and all manner of related items. Some gush with enthusiasm, some waver, undecided, and some crepehangers shriek “Ruined Forever!” On Tuesday, Andrew wrote a piece detailing his thoughts and opinions regarding the Bionicle sets of 2008. As another BZPower representative who got the chance to see these sets in person at the Lego Collector’s Party, I shall do the same. Will my opinions coincide with his, or will they be radically different? Read on to find out. It was last reported that Wal-Mart Canada was no longer going to sell Lego products due Lego not dropping their wholesale price. However now it turns out that Wal-Mart has come to an agreement with Lego, and will now carry their products once more, as reported by the Dow Jones news ticker. The story marches on, this time propelled by the release of the third part of the Mutran Chronicles. This time, there's something most curious about those blade burrowers. We won't tell you what it is right here, though: you'll have to read Part Three itself for that. Bionicle In 2008: How Are They Really? The 2008 Lego Toy Fair Collectors Party has come and gone, and we've now seen the majority of this year's Bionicle and other sets. I'm sure most of you have generated your own opinions about these sets, just as I have. Today I'm going to share some of those thoughts with you, as someone that has had first hand experience with them. Toy Fair 2008 Bionicle Gallery Updated Just a note, more pictures have been added to the Bionicle Gallery from the 2008 Toy Fair Lego Collector's Party. Go check out more pic of this year's upcoming sets! Though Bionicle is expectedly our main focus here at BZPower, Lego had much more on display at their Toy Fair exhibition. Not all of Lego’s lines were represented at the Collector’s Party, but we have full photographic coverage of the event, from Star Wars to Indiana Jones and beyond. Want to see all these new System sets? Read on and revel! This year Lego has mixed things up with their Bionicle line. First, instead of releasing six heroes at one time and six villains at another, they split them up into two mixed groups. Also, for the first time since 2004 there will be no playsets this year. Finally, instead of the usual titans or warriors, we have seen the introduction of vehicles, some of them being very large and all of them featuring great action features. So what do all those sets look like? Read on! It's been a long day, and I need to wake up again in about five hours (I'm hoping for four hours of sleep) but you guys deserve a peek at what we saw tonight. So read on to see the first official glimpse at some of the 2008 Summer Sets! We'll have more in-depth coverage of everything we saw tomorrow. Unfortunately, I have some terrible news to the people who still read these. It is with great sadness that I must inform you that this is the very last Blog of the Week. Period. There will be no extended break with a return marked by "Renewal" or some similar wording. I admit that the last few weeks were the most enjoyable to write, but with the different factors against it, a decision was reached for their time to come to an end. So without further ado, who won this final of prestigious awards? The legendary Toa Nuva return to awaken the Great Spirit Mata Nui and save the universe, but the evil Brotherhood of Makuta stands in their way. For the first time, both heroes and villains will be launching together to provide instant role play adventures. Five new Matoran and six Phantoka -- the spirits of the air -- are available now, to be followed in August by six Mistika -- spirits of the mist -- as well as three larger figures and, for the first-time ever, three BIONICLE vehicles. BZPower will be there tonight for the Lego Collectors Party, expect to see full coverage soon after! You heard right, as has been reported by every BZP member and their dog BIONICLE.com has updated with two Brand new Phantoka games! Play as either the vicious (yet noble) Antroz and dive-bomb the Av-Matoran, or the coldhearted (yet heroic) Kopaka and save them! Check out the games Right here! Toa of Dancing sends word that a friend of his in Croatia received something interesting when he bought some of the new Phantoka sets. 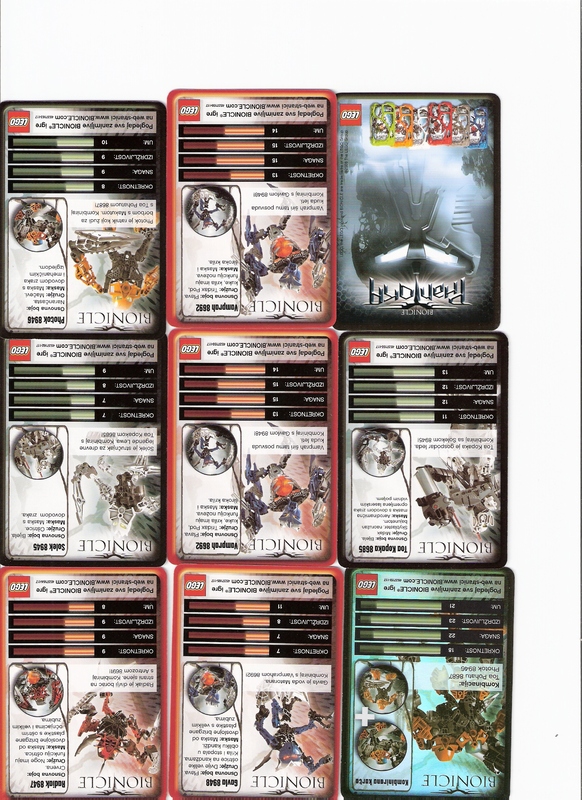 They appear to be some type of Bionicle trading cards, similar to the ones from early in the Bionicle series. You can see scans on their Brickshelf here, here, and here. Perhaps these will make it to other countries in the future. COT Poetry Contest: I Love You! Love is in the air, and the Completely Off-Topic forum is no exception. In fact, they even have a poetry contest going on the subject. There's a catch, though: your poem must be thirty lines or less and include known literary devices. Also, the entry period ends tomorrow at 11:59 PM EST, so if you're interested, get cracking! Early today the 20th episode of the Lego Talk Podcast went live over at LAML. You might wonder why I'm posting this, and the answer of course is that I once again appear on the show. Check it out and listen to me, Mike Huffman, and the host James discuss topics ranging from Exo-Force being canceled to WalMart in Canada no longer selling Lego to what themes we think Lego should bring back. I also tell an interesting story about BZPower from back in 2001 and part of the origin for the site's name. So go listen! The Walt Disney Internet Group announced five new games for cell phones today, as reported by TechGadgets. One of the games, Lego Bionicle Defenders, oddly enough pits the players against the Barraki and their undersea creatures, which are last year's enemies, while the player tries to reclaim the Mask of Life. Still, it's good to see that more forays into the Bionicle gaming world are being made. Bionicle promotions involving candy are not an entirely new thing: Readers may recall the "Kabaya Va" and Turaga of yesteryear that packaged Bionicle sets with Japanese confections. Recently, BZPower member Objective OBZPC again discovered another candy-related Bionicle promotion, a Bionicle cornet. "Cornet" in this sense refers not to a small trumpet but a cone-shaped piece of paper that holds candies. These cornets, available in Germany, are emblazoned with an image of the new Lewa Nuva set and the Phantoka logo. This is certainly one of Lego's sweeter promotions! Thanks to everyone who pointed out a content update on BionicleStory.com. Takanuva has reached the archives of Metru Nui; what will he find there? Check out the third chapter of Dark Mirror, this year's podcast story to find out what he finds! 'Tis a quite fascinating profundity this Blog of the Week; for every week that passes, a blog must be chosen. But if there be no week, there is not a blog of one. Yet if there be no blog, then we should use the week for other means. Persist pondering this predicament and perchance peek at this period's preferred patron. It is time once again for another BZPower set review. Today Great Being #1 provides us with a look at another set, this time the corrupted Matoran Radiak. Is this little bad guy a worthy companion for the larger Makuta? Read on to find out! 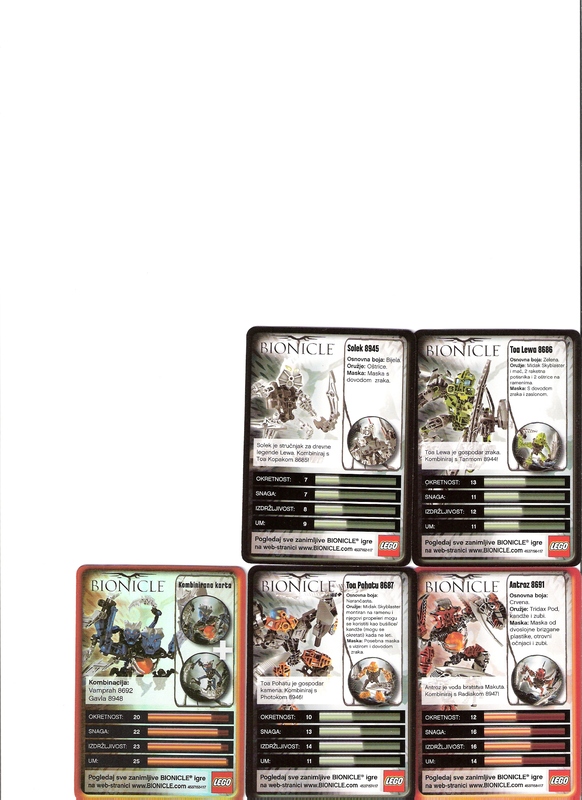 A few of you have noticed a recent update to the downloads section of Bionicle.com. The MP3 area now has song and lyrics downloads for Gravity Hurts, one of the songs featured in this year's video pieces. Go check it out and take a listen! Bionicle comic author and BZP member Greg Farshety has given BZPower a preview of the upcoming Bionicle comic 12. This issue is drawn by new Bionicle artist Leigh Gallagher. Read on to see the full comic page! The Wal-Mart Canada Corp. has confirmed last Tuesday that it will no longer be selling Lego products. While main reasons are left unknown to the public, the simple reason is because of a disagreement in pricing. With the Canadian dollar rising, Wal-Mart Canada asked its suppliers to lower their wholesale price, so that Wal-Mart can keep selling it at a lower price. Lego did not comply with lowering, so Wal-Mart Canada has cut them off. Since this only affects Wal-Marts in Canada, all other Wal-Mart stores worldwide will still be selling Lego products. Further details can be found here and here. As many members have already noticed, BionicleStory.com has once again been updated. Today brings us the next chapter in the much-anticipated Federation of Fear series. Head on over and read Chapter 3 now to see how Brutaka and his posse of villains continue on their quest. BZPower Member BCii noticed something very cool. The Toy Industry Association will be holding their 8th annual Toy of the Year Awards on February 16th. At the event, LEGO Owner Kjeld Kirk Kristiansen will be inducted into the Toy Industry Hall of Fame! You can read more about the upcoming awards and the Hall of Fame right here. The mass of Bionicle-related products and merchandise that are sold on eBay are common things that are not worthy of exceptional note. Occasionally, however, a very rare or entirely unique item surfaces: a solid gold Hau, a white metal Krana-Kal, and other rare collectibles in addition to more peculiar things like components of store displays. Currently being auctioned on eBay is something Bionicle-related that was never even available to the general public. What could this item of utmost uniquity be? Read on for details! If you take a look at your archaic-style calendar or even that one on your computer (it is on after all), you will note the day is Sunday or Blogoftheweekday. What does that mean for you the consumer? Nothing. You are not making a purchase. Read on for more details. It's time once again for another set review. Today BZPower Staff Member Toa Lhikan Hordika details Makuta Icarax. What makes this fearsome villain who he is? Read on! That's right, thanks to many BZP members who've reported this cool find the rest of BZP can find out even more about Mutran and his chronicles. This time we learn about the formation of the League of Six Kingdoms...and how Mutran feels about it, of course. Check it out!